The university isn’t required to calculate job placement rates for students who have completed the program (and the Academy of Art has opted not to). The typical graduate leaves with $35,417 in debt (median debt for borrowers). The typical monthly loan payment is $407 per month with 6.8% interest rate (this is the median monthly payment, if the debt is repaid at 6.8% over a ten year period—this might not be the most realistic number, because a variety of factors influence the interest rate and repayment period). The typical graduate earns $30,171 per year post-graduation. Alright! Enough of the numbers! Let’s talk about the program. There are a number (oops, sorry) of areas you can focus on under the umbrella of animation. This focus only has a BFA available. This focus is available as BFA and MFA degree programs. This focus is available as AA, BFA, and MFA degree programs. Who Teaches in the Animation & Visual Effects Program? Chris Armstrong: He spent more than 10 years working at Industrial Light & Magic. He worked on Star Wars Episode 1 and Star Wars Episode 2, and other projects, like Galaxy Quest and The Mask. Tom Bertino: He spent nearly 20 years working at Industrial Light & Magic. He also worked on The Mask, and was nominated for an Academy Award and BAFTA for the CG work he did. He’s worked on a lot of projects—that’s what happens when you spend over 30 years in the industry. Charles Keagle: He’s worked on Ren and Stimpy, he’s worked at Pixar on Toy Story 2, and he worked on South Park: Bigger, Longer and Uncut, among other things. He’s had work shown at New York’s Museum of Modern Art. Sherrie Sinclair: She worked with Disney for just about nine years with credits on films like The Lion King, Mulan, Tarzan, Pocahontas, and Lilo and Stitch. One more, for good measure (although this is far from the whole list!). Elizabeth Sousa: She’s created work for a long list of big-name companies: Disney, Maxis, Paramount, Virgin, ABC, NBC, and Fox. She’s been a professional artist since 1978 and teaching at the Academy of Art University since 2003. The Animation and Visual Effects program is on the expensive side (spoiler alert: they all are). There are a lot of well-connected staff members. And it is located in San Francisco, which is a big animation and visual effects hub. You’ll have to decide if the cost is something you can handle. You might also be interested in their online degree program for Animation and Visual Effects. You’ll know about game engine tech, fundamental game art principles, and pre-production to post-production processes. You can pick between a number of different game development areas to focus on. The option to customize is only helpful if you know your choices, so we’ll touch on them quickly below. The Game Development program is offered as an AA, BFA, MA, and MFA degree program. You’ll get good with Maya, using it to model and texture assets. This typically comes from write-ups on the character. This is another field that’s heavy on references and inspiration. This requires developing interesting narratives and fun gameplay rules. As we spend more and more time with screens in front of our faces, this only becomes more important. Let’s take a look at who’s teaching in this department! David Goodwine: He’s worked in the industry for 17 years, spending 13 of those years working on games. He’s worked for Double Fusion, Electronic Arts, PDI/Dreamworks, and more. He has credits on titles like Lord of the Rings: The Two Towers, Project: Snowblind, Lord of the Rings: The Return of the King, and more. David Graham: He’s worked at Electronic Arts, PlayFirst, Planet Moon Studios, and Slipgate Ironworks. He’s been working in the industry for over a decade, and he co-wrote Game Coding Complete, 4th edition. Gotta’ love it when you get the person who “wrote the book” on something. There are more industry powerhouses on the list! But for now, we’ll keep moving. But the median debt for this program is slightly higher: $43,627. This obviously makes the monthly loan payment higher ($502 with 6.8% interest—again, not the best estimate to measure against). Also, the typical graduate earnings are not listed for this program (neither are the placement statistics). So it’s still a huge cost to attend here, barring significant financial aid—that much didn’t change with the program. You do have less of an idea of how much your peers earn once they graduate and find a job. Some internet snooping might be able to fill in the gaps. Once again, the lack of a guarantee of success shows up! You’re the real deciding factor. The Graphic Design program has a home in the School of Graphic Design (who saw that coming?). The estimated program costs are the same as the other two programs. The typical debt level for graduates is $38,850. And the median earnings after graduation is $58,386. This program is offered as a 66 credit AA degree, as a four-year certificate, and as a BFA degree program. There is an online graphic design program as well, available as an AA, BFA, MA, and MFA online degree program. Outside of the different degrees, there aren’t highlighted areas of focus or interest. This program also boasts an impressive list of instructors. Mary Scott: She’s worked on projects for Sony, Disney, Microsoft, Procter & Gamble, Hitachi, and more. She’s won industry awards. And she has almost 40 years of experience—and she might be teaching your portfolio class. Anitra Nottingham: She’s worked as a book designer for Penguin Books Australia, and Oxford University Press. She’s also led teams as the creative director for companies like Intuit. There are more professors to see, if you’re interested. This program is expensive (third time you’re hearing this, we know). Students have gone to Academy of Art University and now they are working their dream jobs on Titanfall 2, or League of Legends, or whatever their dream job happens to be. There are also students that have paid for this degree and are not working their dream jobs, for one reason or another. Your degree is not the most important thing to your career in any of these fields (hint hint, your portfolio is more important). The connection to the industry through experienced faculty members is a big plus. 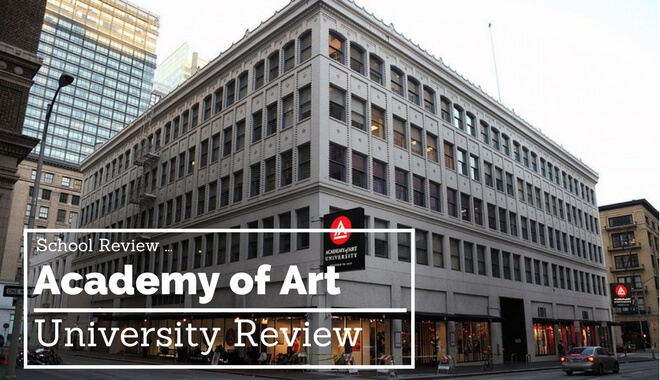 So is the network you’ll enter, and the like-minded individuals that will surround you at the Academy of Art University. But it’s the time you put in that will really make the difference. The time you put in, and the work that comes out of that. You have to decide if four years and six figures is more advantageous than a smaller, less expensive program. Keep researching. Make the most informed choice!